The property was very clean - a large space and nice kitchen. The views from the front porch were lovely, waterfalls, church steeple, beautiful flowers among others things. We were a three to five minute walk to the train station with nice shops along the way. A wonderful find for sure!! Thank you Jane for your nice review.Lauterbrunnen is ideal for people like you who love nature and hiking in high mountains.Wish you all the best for the future. It was good , had everything needed for an enjoyable stay , lots of info and ideally situated to go up either side of the valley . Although the info says there is a garden , this is not a garden to sit in but a flowerbed in front of the property . It was not an issue as there is a nice verandah to sit outside . The apartment was clean and charming, and had all you need for a week away. It was perfectly situated for exploring Lauterbrunnen itself as well as the wider valley. We did initially find the bed a little on the firm side ( and the pillows ridiculously soft) but it was perfectly serviceable. Lauterbrunnen is a beautiful village, big enough for shops, restaurants etc, but not too big. Though we arrived by car, we then did not use it again for a week ( unprecedented for a holiday ) as we travelled everywhere by train, cablecar or on foot. We visited Wengen, Murren, the Jungfraujoch, Mannlichen, Gimmalwald and Grindelwald, all of which were well worth a visit, or two. We also went to Schynige Platte, a place I hadn't researched before our arrival, and it was one of my personal favourite days out. The jungfrau pass is a must, even if only for three days. For a non-walking-in-the-mountains-day try Brienz or Thun and it's Oberhofen Castle. Thank you Helen for the nice review with your personal expériences in Jungfrau region. The Jungfrau railways was giving pass for a minimum 6 days before . Now they are starting from 3 days , 4 days and more . Hence the guests can choose depending on their places to visit on the high moutains and also other places outside Jungfrau region . The region outside this area is called Berner Oberland which is also quite beautiful and worth travelling . You have mentioned Thun which is called the city of the Alpes. Here there are 4 castles for interested tourists.Oberhofen castle is high demand for conducting marriages and parties . The infrastructure in Jungfrau region allow tourists to move around in public transport easily. We have different beds in the chalet apartment . The one you have used is a new one with several options . You can raise the head part if you wish to read something before sleeping, can also raise the other end , if you wsh to sleep with your feet a little raised , can also soften or harden by pulling adjustments underneath. Peope with back pain prefer firm bed. Will check if the pillows are soft. 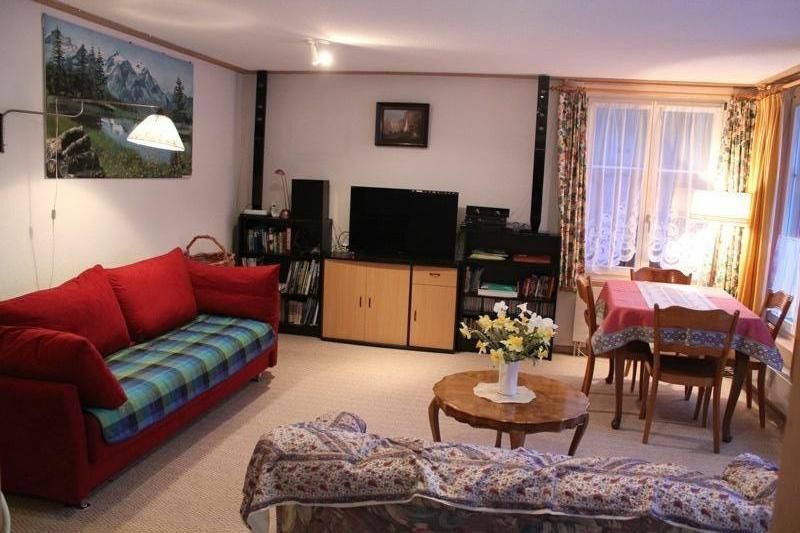 Glad to know that you have enjoyed your stay in Lauterbrunnen . Wish you all the best . Augustine and Celine extremely helpful and quick to respond to any queries. View of the Staubach Fall beyond the church is lovely as is the view up the valley. Quiet location and with bus stop for the train station or up the valley 100 yards away and half hourly service during the day to connect with train arrivals and departures. Well equipped compared with many apartments. The new microwave is simpler but the dinner plates are too big to go in and most other plates and small dishes aren't microwaveable with gold on them. Superb location for walking and views (given good weather) and very easy to get away for the international crowds going up to and back down Jungfraujoch. Our family of 4 (two sons aged 14 and 9) stayed here for two weeks. It was an excellent base for us to explore the area. The spacious home was very comfortable and had everything we needed. The location was also very convenient, as it was a quick and easy walk to the train station, grocery store, etc. We loved sitting on the patio in the evening looking at the waterfall and into the valley. Our boys enjoyed the playground that was only about 3-5 minutes away by foot. They also tried the mini golf, which is near the playground, and had a lot of fun. The outdoor swimming pool in town was a big hit, too. We went there a few times, since we were lucky enough to have some really warm days. The owners were very helpful prior to and during our trip. They were pleasant and welcoming and provided good tips of where to go while using our Swiss Travel Pass. We really appreciated the personal attention and ideas that fit our family well. We wish we could have stayed longer. There are so many places to explore in this beautiful region! The price includes heating, hot water, cleaning, linen and towels, shampoo, taxed garbage bags (2 per week), parking, tourist tax excluded. Security deposit of euro 250 is required. It will be returned within 14 days of departure and is the subject to the apartment being left in good condition. Tourist taxes : chf 3.20 per person and per day - for children between 6 - 16 : chf 1.10 per child .